Sometimes the most memorable surprises are found in the most unusual places. In today’s post, I share growing a My Boutique Container Rose. 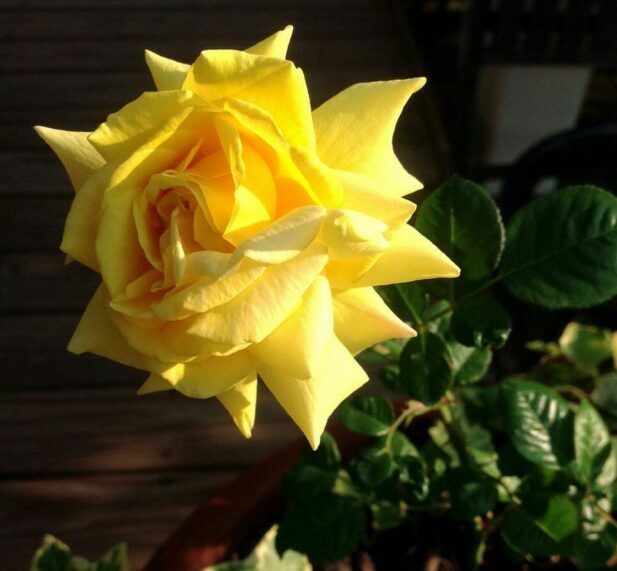 The solid yellow bloom of this My Boutique Rose is one of those surprises like many of the other bareroot roses I found this summer stuffed in plastic bags and merchandised in crates on shelves sometimes not even in a garden center. I find the best roses in the most unusual places at garden centers locally. In early spring 2013, I found a basket of root roses for sale at the grocery store. Wrapped in a unique patterned plastic bag and the $4 price tag caught my eye. The package read ‘ Elegant Blooms. Patio to vase’ – how cool is that?! My Bouquet happens to be from Ball Horticulture. This variety is a cross between a miniature rose and hybrid tea form. The bloom pedals are a thick velvet to touch – unlike any other, I’ve ever grown in my garden. I loved having this compact rose shrub growing on my pond deck and being able to cut a bouquet to take indoors. The roses seemed to last a week or two longer than my other roses. 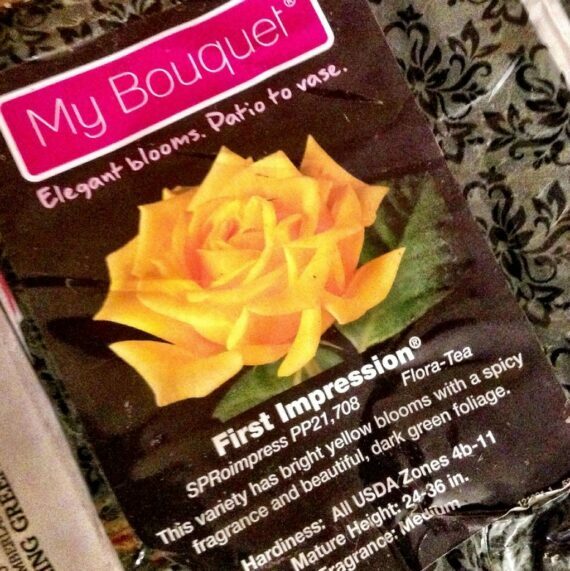 I want to note that most roses labeled ‘container or miniature’ rose will perform the same way as My Bouquet Rose variety. The most important thing to remember when planting a rose in a container is that you allow good drainage. Roots of the roses do not like to get too wet nor do they like to be too dry. Be sure to pick a container with drainage holes. Keep in mind if you plan on keeping the rose container outdoors for the winter because you will need to use a freezer-safe material. Check the container description to be sure the material can withstand the cold in your area. The bloom was unlike any other: as a heavy velvet fabric so you will want to encourage new blooms to enjoy. My Bouquet rose bloom last much longer then the roses I would cut and bring indoors to enjoy during the summer months. On the plant, the bloom would turn brown along the edges as it wilted – hardly showing any signs of it fading weeks after opening. This rose is a must in any container or landscape labeled as a winter hardy able to survive 20*- F.
The rose loves to be fed an organic fertilizer to keep the blooms coming. I recommend watering the rose as needed and feeding once a week to encourage new buds to form. My first container rose varieties were left outside for the winter in hardiness zone 5b. As of 2018, I have 8 different container roses I grow year-round in my geodesic biodome. Most roses can withstand freezing temperatures of -10 F for a short time during the winter months if they aremy geodesic biodome. Curious about growing roses in containers or maybe just want to say hello? In conclusion to reading this article you are welcome to contact me on my website to share more. I am also eager to connect with you on social media so be sure to click the links provided tagging @brenhaas . The lettuce was an accident… it came up as a volunteer! I will keep you posted how this rose does through the winter. I think leaving it in the pot will be risky for several reasons: plants in containers are not insulated like ones in the ground and yellow roses tend to be less hardy, genetically than others. It is the repeating freeze, thaw cycle that kills roses in the spring. Thank you Elena – I’m going to move the container back to a corner outside of the greenhouse. I will be protected by the winds and harsh conditions usually found in Ohio. I really want to see if this rose will hold up to it’s ‘hardy’ label. Thank you for making rose growing so much fun. I love the great connections I’ve made learning how to grow roses. Awesomeness …. you know I’m tweeting about how helpful you are. I appreciate the gardeners who share using social media. Beautiful rose and good timing! I have almost killed a mini yellow rose that I have had for 10 years by digging up the liriope that was out of control. This will be my backup plan! Great to connect CC – I’m glad this information was useful for you. Lets stay in touch to see how these roses do Spring 2014. I’ve been hearing rumors our winter is suppose to be really rough here in Ohio. The lettuce added an unexpected touch. Maybe you can transfer it in a bigger pot and let it camp out as the rose’s friendly neighbor. I wish I have a little of your green thumb…such beautiful flowers! Thank you for visiting my site …. I’m so happy I found your blog this morning! ASK ME ANYTHING about gardening Maria – you can grow too! What a great little rose! I am a fairly inexperienced gardener myself and have only just started looking around for potential plants for a garden box I am putting together. I’ve always loved roses but have been too scared to try them myself in fear that they will die! This one looks so easy maintenance and pretty that I just may have to get one myself.